Toys play a critical role in the early years of our lives. Since the early days of mankind to the current modern and digital world, toys have taken many forms. As a parent, I always try to introduce new and different toys to my juniors because I want them to learn as much as they can in the early days of their lives. In Toca Robot, scrap together old parts to create your own unique robot. Is Toca Robot Lab an App, a Game or a Toy? Toca Robot Lab is a rarity. You can find a lot of great educational apps and games on the App Store, but it's not easy to find great toys. Unlike puzzles and games, toys have no rules. For this reason as well, toys have an excellent replay value. Toca Robot Lab is a toy, a digital one at that, because it has no rules. 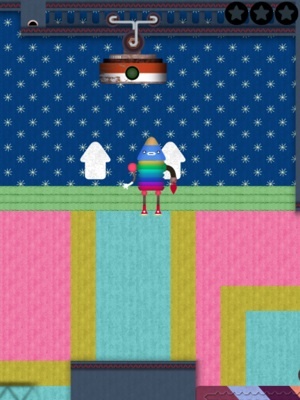 Throughout the app, you build your own robots from scraps and other used goods. You start from the legs, then move on on the stomach, the head and then finish with the arms. Each step of the way, you're presented with three choices, allowing you to create an (almost) infinite combination for your robots each time you play. After creating your robot, you get to test it in the Robot Lab. By dragging your finger anywhere on the screen, you can make your robot fly in the direction of your choice. When you see the big magnet, fly to it to submit your robot for report. Afterwards, you can restart the process and create a new robot from scratch. Toca Boca Robot Lab encourages juniors to experiment with various used items and scraps to creatively design their own robots. While this seems like a trivial thing to do, the app tries to inspire them to perform the process in real life by creating 3D model of their own robots using whatever materials they can find in the house. Even though the real-life robots your juniors built may not be able to fly, they will enjoy the creative challenge. Similar to other apps created by Toca Boca, Toca Robot Lab has beautiful illustrations, animations, music and sound effects. They are professionally done, making the app a great enjoyment to play with. If you take the time to read the letter from Chris Lindgren, the play designer of this app, you will definitely feel the great care and attention that she and her team have put into this app. You can find the link to the designer's letter on the top left corner of the home screen. Philip loves the app. He really enjoys the process of creating his own robots and flying them around the lab while collecting stars along the way. He also likes to explore the different lab design each time he flies a new robot. One thing I noticed was that ever since I installed the app, I have never told him what to do. No rules. In fact, until the moment I read the designer's letter, I also had no idea what the rules were or whether there was any at all. By the way, if you played Nintendo Game Cube in the past, you'll love the fact that the replay button is designed as a much bigger button when compared to the home button. This has single handedly caused Philip to replay the robot building process endlessly. If you're looking for an app that can fit the roles of toys in your juniors' lives, I highly recommend Toca Boca Robot Lab. It's a great app that encourages them to play, experiment and have fun. Get Toca Robot Lab on the App Store.